Hair Loss in Women: 3 Reasons Why Missing Strands Can Happen to You! Women’s hair loss is very emotional because hair is a part of our identity. However, the causes of hair loss can be due to many reasons besides harsh hair care practices. Hair loss can occur due to a lack of iron and/or biotin in your system. Iron creates the hemoglobin in red blood cells which give the cells that nice red color. This protein also carries oxygen from the lungs to the rest of the body. Biotin is a B vitamin, B7 to be exact. Biotin helps us turn food into energy. Obviously our bodies need both of these. Hair loss is only the beginning consequence without them. Not having enough protein in your body is also what causes hair loss. When your body lacks protein it will conserve whatever amount it has left and change whatever phase your hair is currently in to the resting phase. Yet, hair loss can also occur from having too much of a good thing such as vitamin A. Consult your doctor before starting to take any supplement and do your research on all side effects. Keeping a food diary will help you monitor your eating and any vitamins you take so you can keep track of the amount of supplements, protein and iron you consume daily. 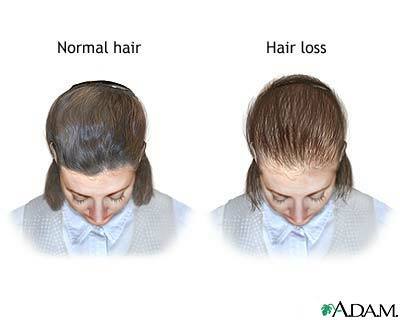 Losing Weight Can Cause Hair Loss? Weight loss is another factor that can contribute to hair loss according to the AAD.org at skincarephysicians.com. This is why it is imperative for you to observe your appearance, and and how you feel when adjusting your diet or making any lifestyle changes. Communicate any hair loss symptom to your doctor because sometimes hair loss is not always due to the blowfryer but may be indicative of a health issue. This image is from Medlineplus.gov. Click here to learn more. Alopecia (al-o-pee-shuh) means partial or a total loss of hair. There are different types of alopecias that can contribute to hair loss. One of which is alopecia areata which is a condition where your own immune system attacks your hair follicles leading to baldness. The cause of this disease is unknown. Autoimmune diseases like lupus, can lead to alopecia areata. Talk to your doctor if you find that you can’t explain your hair loss. 3)	What Medications are you Taking? There are medications such as prograf (brand name) which has the generic name tacrolimus. Prograf treats those who have had kidney transplants by keeping the body from rejecting the new kidney. Prograf makes your body's white blood cells weaker so they cannot damage your new organ. However, it can also cause hair loss. And, according to the AAD.org at skincarephysicians.com, “Medicines that treat arthritis, depression, gout, heart problems, and high blood pressure” may also lead to hair loss. Talk to your doctor and do your hair loss research. Medlineplus.gov is a treasure trove of information for finding out the side effects of a prescription medicine. Monitoring your diet habits, vitamin and food intake and knowing the ingredients and side effects of any medicine that you are currently taking can lead to vital hair loss information. Your body, mind and follicles will thank you. *I am not a doctor or dermatologist. Please consult your doctor if you are experiencing hair loss.